The Indian hospitality sector has turned over a new leaf with portable hotels in Gujarat. 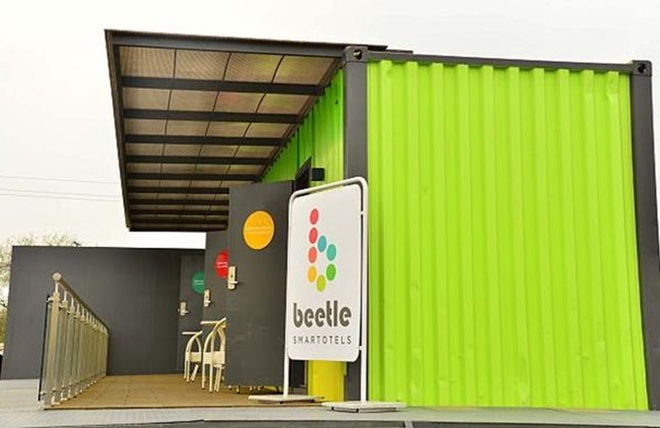 Ushering a new era of sustainable, eco-friendly hospitality, India’s first portable hotel project titled Beetle Smartotels is the brainchild of an Ahmedabad-based entrepreneur Tanmay Bathwal who owns and runs Hirise Hospitality Pvt. Ltd. Launched in Mundra-Sez in Kutch district of Gujarat, the portable hotel consists of discarded shipping containers as rooms which can be moved to any corner of India. Such an environmentally conducive venture is ideal for hassle-free hospitality in remote locations, venues with huge mass gatherings like Kumbh Mela and industry places where new construction is not feasible. According to Tanmay Bathwal, India’s first portable hotel with discarded shipping containers in Gujarat will have posh interior décor, plush upholstery, safe lockers and fool-proof security systems. He is looking to add 2,000 portable hotel rooms to the existing hospitality infrastructure in India by 2018. Multi-storey room installation is the next phase of his plan. “Unlike brick and mortar hotels which require minimum 3 to 4 years for construction, a portable hotel can be developed in only 3 months. The concept of Smartotels is based on recycling and sustainability. What it requires is the base support for containers. We will create an inventory of such ready-to-move rooms so that we can transport them to wherever and whenever there is a demand,” says Tanmay Bathwal. India’s first portable hotel with 141 rooms across 7 acres in Mundra cost INR 20 crore. Each of the rooms cost INR 15 lakh for interior décor, furnishing, amenities and facilities. With three-layered insulation at bottom and top, the portable rooms are sound-proof and have AC cooling inside. One container consists of three rooms with a dimension of 13 x 8 feet each. It is as comfy and luxurious as a plush hotel room.